Neptune-size planets like this one, drawn orbiting the star Gliese 436, may be able to form around stars that contain far less metal than previously thought. How low can you go? Astronomers have found a star with an incredibly low concentration of heavy elements that still has a sizable planet around it — the most metal-poor star ever discovered with an orbiting, rocky planet. The planet found circling the unlikely star suggests that other Earths could be more common than once thought. To make planets, you need elements heavier than hydrogen and helium. In astronomical parlance, these elements are known as metals, even though they include substances like oxygen, silicon and carbon. Astronomers can measure a star's metallicity, or the ratio of heavy elements to hydrogen, by looking at the wavelengths of light coming from the star and comparing its metal content to the surrounding regions of the galaxy. The metallicity of a star also tells you what was likely in the cloud of gas and dust that formed it in the first place. Researchers generally expect stars with high metallicity to be more likely to have giant planets like Jupiter — in fact, astronomers target such stars in order to boost the odds of seeing a planet, Mortier told Space.com in an email. But for rocky, Neptune-size planets and those that are smaller, that correlation doesn't appear to hold. That's why the HARPS is looking at low-metallicity stars to see how low that ratio can go before the star no longer has planets at all. "For Neptunes and Earthlike planets, it is not as clear yet what the role of metallicity is," Mortier said. In this case, the star HD175607 appears to have a planet orbiting it at a distance that's about a third of Mercury's to the sun. It completes a "year" of orbit in 29 days and weighs between 7.88 and 10.08 times as much as Earth, putting it at about two-thirds the mass of Neptune — which has a mass that's about 17 times that of Earth's. Planets are hard to see to begin with; finding the one around HD 175607 took months of observations spread out over nine years. The researchers had a much easier time measuring the star's metallicity. Knowing what kinds of stars to target would go far toward helping observers discover other Earths — and a big question that remains is what kinds of planets are around what kinds of stars, Mortier said. Jarrett Johnson, a scientist at Los Alamos National Laboratory who has studied exoplanets and their relation to metallicity, told Space.com that this discovery of a rocky planet around a metal-poor star bodes well for finding more of them. "This is good news as it is evidence that lower and lower mass planets are being found around metal-poor stars, as more data is gathered with more powerful techniques [like HARPS],” he said. The discovery will also help refine models of planet formation. Currently, many scientists think that planets form when smaller objects group into bigger ones, which is called the core accretion model. 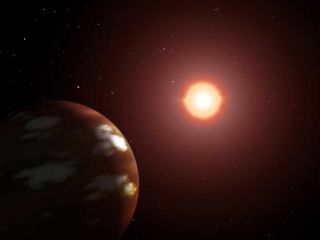 In a 2012 study, Johnson worked out estimates of how much iron and other heavy elements had to be present to accrete planets, and new discoveries like this one could show whether those estimates are correct. The study was accepted for publication in the journal Astronomy & Astrophysics in November. You can Follow Jesse Empsak @Mad_Science_Guy. You can follow us @Spacedotcom. We're also on Facebook & Google+. Original story on Space.com.